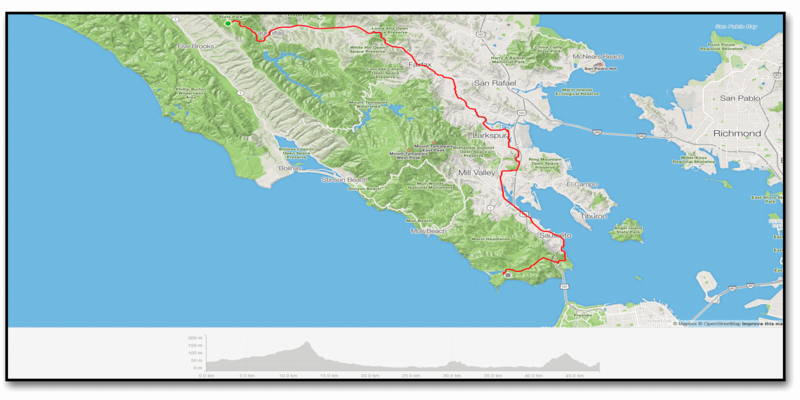 Day Thirty Two – Samuel Taylor State Park to Marin headlands Hostel. We leave our new friends and head out for the Marin Headlands overlooking the San Francisco bay. The ride was pretty good as there is a comprehensive network of bike paths that we were able to ride on most of the way. Also, riding through Sausalito is pretty cool as you can see the city and Alcatraz and Angel Island. When we arrived at the hostel we found it is situated in an old 19th century army base and the hostel itself was formerly a hospital. There are tons of vintage army buildings in this area and a Nike missle base so it is definitely worth a visit. We have to get up early as we have a brutal ride through San Fran tomorrow and we just found out from the Ranger lady that temperatures in The Bay area set an all-time record today for the hottest ever recorded. Great! We seem to be cursed on this trip. Mount Tamalpais – hopefully Google won’t make us climb it! Better through the tunnel than over the mountain. Visitors center in Marin Highlands – formerly the base church. Did you say this was the hostel? Yikes the swim team have taken over the hostel! Stay out of the Nike base. Foggy shot of the Golden Gate Bridge. Pumped to see the recent updates. Please be safe and smart with that heat! ? What can I say except “awesome “! We’re loving your blogs and photos. Please be careful, especially with the extreme heat! We could do with some of it here! Weather still horrible. Sending love.